. Learn how to create incredible plays with your students with this step-by-step guide. Have you ever been fascinated by the idea of writing a play with your students, but never knew where to start? Do you ever feel stuck for new ideas on how to get more from your students when it comes to creative writing? How to get them to dig deeper to move beyond two-dimensional characters and simple stories? 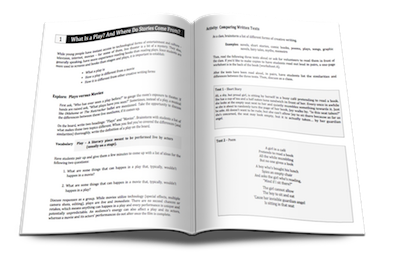 Introducing Teaching Playwriting, a 108-page eBook that will completely transform how you explore creative writing in the classroom. 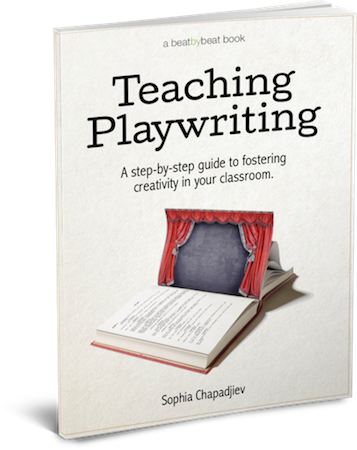 This book not only covers the basic concepts of playwriting – but it also provides in-depth step-by-step curriculum with three different teaching tracks on how to create plays in the classroom from start to finish. Scroll down below to download a FREE chapter! Similar to our best-selling Teaching Drama: The Essential Handbook, this book is written in a practical lesson-plan style that will instantly allow you to implement these tools into your classroom. Each chapter builds upon the next, and includes helpful shaded boxes offering teaching advice, side-coaching suggestions, text samples and vocabulary words. What is a play? Through the exploration of provided texts students will discover what makes playwriting unique from other forms of creative writing. Dialogue. Students will learn how to write character-specific dialogue that keeps audiences engaged. Conflict. Students will understand the importance of raising the stakes and how to use conflict in a way that builds interesting scenes. Plot Sequencing. Students will learn how to use a plot diagram to chart out the world of a play. Creating a Character (from a photo). Students will learn the 8 W’s of character development – then create an original character from an image. Creating a Character (from props). Students will learn that new ideas can come from anywhere – even everyday props in the classroom. Creating a Character (from improvisation). Students will engage in improvisational activities with the focus on serious character development. They will also understand how characters must move the plot forward. The Monologue. Students will learn the tools necessary to create a compelling monologue that rings true to their characters. Review, Revision, Rubric. Students will learn how to effectively review and revise their plays with peer participation and a provided rubric. 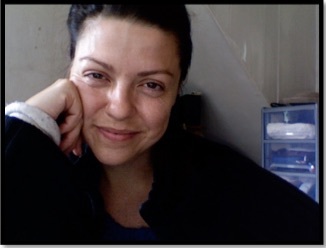 Sophia Chapadjiev is the Artistic Director of the Young Playwrights Festival at the Eugene O’Neill Theater Center where she has been the Director of Education since 2007. She has faciliated professional development workshops at educational conferences around the U.S. As a playwright, her works have been produced in New York City and London. She has a BFA from Emerson and an MFA from NYU’s Graduate Musical Theatre Writing Program. This book will provide you with everything you need to teach a semester of playwriting your students will never forget. All in a simple printable guide that’s affordable and instantly usable. Sophia regularly travels to schools to give Professional Development workshops on playwriting that typically cost upwards of $1,500. Online courses on playwriting start around $400. You can download Teaching Playwriting: The Essential Handbook, a book we guarantee will provide you with everything you need to teach well structured and highly rewarding classes in playwriting, for only $39. ✓ A 30-day no-risk guarantee! At Beat by Beat we’re passionate about raising the bar on the quality of resources that are available for drama teachers…and you’ll find this eBook to be no exception. Over 55,000 people a month visit the Beat by Beat website, discovering tools and resources which have brought joy to teachers and inspiration to students in over 60 countries. You have our personal guarantee that if you aren’t completely satisfied, if you don’t love this teaching resource and use it semester after semester, call or email us within 30 days and we’ll refund every penny immediately.